Top Notch Material: Buddig Makes Summer Lunches So Much Better- Win a Lunch Kit! Buddig Makes Summer Lunches So Much Better- Win a Lunch Kit! Another alternative that I love beyond making sandwiches is meat and cheese roll ups when we are on a low carb diet. I often make these and pack them for my husband when he goes to work so he can have a lean meat and cheese roll up that is good source of protein, are gluten free, contain no MSGs and 0g trans fat per serving! I roll up about 5 or 6 of these and he has a few with lunch and the other two as a snack throughout the day. It is delicious and healthy for him while he is busy, on the run at work. They are even better if you put a little brown mustard in the middle to give it a little "zing." We prefer it with either the ham or turkey. My sons favorite is the Smoked Ham and mine is the Rotisserie Flavored Chicken Breast. 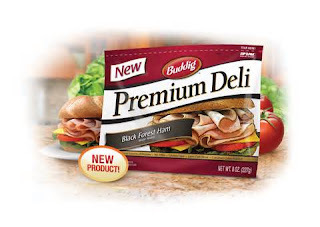 The Buddig lunch meat also has lower sodium than other competing brands! There is usually a whole lot to smile about around here (vacations, birthday, summer break) but Buddig is giving you a whole love more to smile about by offering awesome contests! 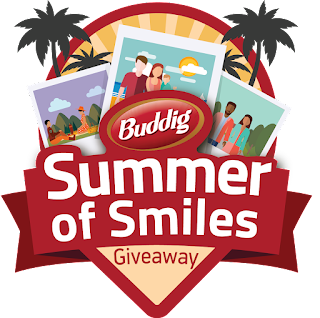 Summer of Smiles: To be entered, you are asked to post a picture of your family enjoying summer and flashing your biggest smiles on Facebook using hashtag #BuddigSmiles each week from June 16 – August 18, Buddig will randomly select 12 entries to receive a $25 American Express gift card! A total of 108 prizes will be awarded! Winner can only win one prize pack. So if you win on this blog, you are not able to win on another blog during this current promotion. Also be sure to check Buddig out on Facebook for Clever Lunch Ideas for your little ones this summer! This post and giveaway were made possible by iConnect and Buddig. I was compensated for my participation in this campaign, but all opinions are 100% mine. The sponsor and any compensation received for this post in no way affected my opinion or any statements presented in this post. Prize is provided by the sponsor and is not TNM responsibility to provide. Top Notch Material blog always provides honest opinions, beliefs or experiences on products and services reviewed. If you have any questions or would like your product, service or company featured on Top Notch Material, please contact YOUR NAME from Top Notch Material at nursemommypaige at yahoo dot com. The disclosure is done in accordance with the Federal Trade Commission 10 CFR, Part 255 Guides Concerning the use of Endorsements and Testimonials in Advertising. The most current Buddig giveaway ended 1/31/16, so I could not enter.